Up until week 36, my pregnancy was pretty text book without any complications. At my 36wks, 3days appointment my blood pressure started to spike up pretty high. At that point, the doctor told me to try to relax as much as possible at home and that we’d continue to monitor it the following week. At my 37wks, 3 days appointment my blood pressure continued to be high so they sent me straight to labor and delivery for monitoring. I was hooked up to machines and my BP was monitored for hours. Whenever I laid down my blood pressure fell below 110/70 so at that point it was decided that I should start on bed rest. In the meantime, I was scheduled for an ultrasound and weekly NST scans to check on the baby. I was about 37wks, 5 days when I went in for my ultrasound and at that point, Grayson was measuring 8lbs, 4oz. The specialist decided that because of his size and my blood pressure that they’d prefer if he was delivered before I hit 39 weeks. I was scheduled for an induction on November 10, 2011. 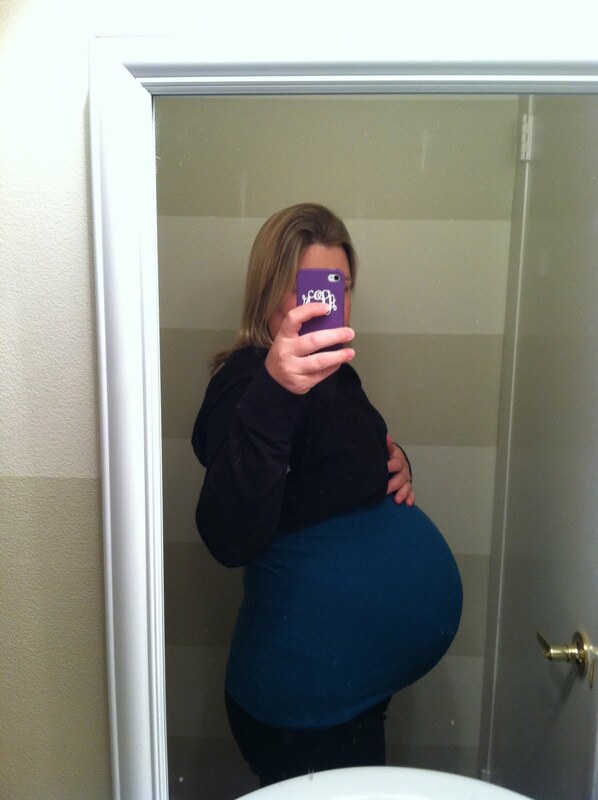 I would have been 38wks, 6 days pregnant. Two days before my induction I ignored my bed rest instructions a little bit and went out for a pedicure and did a TON of laundry (i.e., I walked up and down my stairs a million times) to help prepare our home for the baby. On the 8th, hubs and I cuddled up on the couch, watched TV and ate Chipotle. We sat around saying, “only two more nights without a baby” and imagining what he would be like. At about 2:45 am I had a dream that my water was breaking and thought I felt a little something, but didn’t think anything of it or even wake up long enough to check what it was. A few minutes later I rolled over to get more comfortable and I felt a pop and a trickle of water. I ran to the bathroom and sat down on the toilet thinking that perhaps I wet my pants (had never happened before, but I hear it happens to pregnant ladies). When the trickle didn’t stop for over 10 minutes, I figured it was show time. I yelled from the bathroom, “Umm, John! I think my water broke.” The next half hour was a whirlwind. I jumped in the shower, we packed up the car quickly and we were on our way to the hospital. We arrived at the hospital at about 4am where they checked me in immediately. Upon arrival, I was only about 1cm dilated and 80% effaced (I was closed up on Monday). From 4am-7am, I got my IV and we waited to see if my contractions would start on their own. I did have a few contractions but they weren’t regular/strong enough and pitocin was started at 7:30am. I needed a lot of pitocin to get things started. The highest dose that they will give you is 24, and I made it all the way up to 22 before things really got started. Of course, Grayson was sunny side up, so I was experiencing back labor. I got an epidural at 11am. I could have waited, but there was a line out the door for epidurals so it was a get it now, or wait hours type of situation. The nurse suggested that I get one soon to help relax my pelvis and to help my cervix progress so I did. The next few hours were heavenly. I napped, watched TV, played around online and just relaxed before the hard labor set in. I told my doctor that I would do this one hundred times it was so enjoyable. Ha. My doctor came in at 2:30 and I was already at 4cm. Although this was good, she expressed her concern about the fact that I had developed a fever and she said we would need to monitor things closely. She said that at a minimum, Grayson would need to be in the NICU for at least 24 hours (and up to 7 days) because a fever makes it very likely that I had a uterine infection (which is a result of water breaking spontaneously). They started me on antibiotics and said that we would wait and see how things go. At 4:30, I was 5 cm. The doctor decided that if I did not hit 7-8cm by 7:30pm that we would go for a c-section simply because I was already at the heaviest dose of pitocin and my contractions were not regular. Between 5-7pm, the baby started to go into distress. His heartrate was all over the place and the nurse was very unhappy with how things were looking. They started to call for a c-section again and while waiting they made me lay on my side and put oxygen on me. These two interventions helped, so we went back to the waiting game. When the doctor checked me again at 7:30, I was finally 8cm and the baby was doing well with me on my side. At that point, she said that we would wait and see how things go. At 8:30, I was 9.5cm and the pain was beginning to become unbearable. I didn’t feel contractions, but at that point, Grayson had descended into my cervix and the pressure was unlike anything I had ever experienced. I literally felt as though my pelvic bone was about to burst into a trillion pieces. They boosted by epidural a few times, but it didn’t really touch the pelvic pain for more than 15 minutes or so. At about 9pm, the doctor came back and had me push for a bit—with very little progress. I couldn't believe it because it felt like his head was literally falling out of me. She said she wished that was the case and that he was engaged, but he was not moving down the canal. She noted that there was an anterior lip on my cervix that the baby was getting caught on. She said that I would need to lay on my other side in an attempt to have the baby’s head stretch that area out. I had to wait ANOTHER hour. The pain was ridiculous and although John was so supportive, I literally thought that I was going to explode. When the doctor came back at 10pm she said that we had two options- we could wait another hour to see if I progress past 9.5cm (I had been there for two hours) or we could go for a c-section because the baby was still so high and because I was stuck at 9.5cm for 2-3 hours at this point. I asked her and the nurse for their opinions. She said that we could try to push, but that it was a possibility that I may need to push for up to 3 hours to get him and still need a c-section. She also noted that there was an unprecedented number of c-sections that night (it was a full moon) and that there was a line for the OR. At that point, I asked them to keep the pitocin going, but to also schedule me for the OR just in case. I begged her, please tell me this can happen by 11 (it didn't). I was so spent and the pain was so intense. Well, emergencies kept coming up and I kept getting pushed back and my cervix wasn’t dilating past 9.5cm. Finally, after seeing how much pain I was in, they called in a second anesthesiologist and opened a second OR. Apparently, this rarely ever happens (the night Grayson was born, they had 9 c-sections). Luckily, my nurse was feisty and when another doctor tried to cut us in line, she told me that she flipped on their nurse and rushed me out of my room ahead of them. I kept my eyes closed almost the entire time in the OR so I can’t tell you what happened in there. I was terrified and exhausted. My water broke at 3am on the 9th and I was just being wheeled into the OR after midnight on the 10th. I had had nothing to eat in almost 24 hours and the last 4 hours of my labor were literally exhausting. My c-section was a whirlwind. I remember them asking me if I felt something really cold on my stomach. I felt something on my stomach, but it wasn’t cold (John said that that was when the cut into me). I know that once they gave me the anesthesia my blood pressure must have dropped significantly because I kept screaming out, I’m fainting. Everyone, help me! I’m fainting. I remember some lady rushing up to me asking me my name, what I’m doing there and trying to distract me. John was by my head rubbing it. I asked John later if I fainted (I swear I did), but he said I didn’t. After about 5, 10, 15 (I couldn’t tell) minutes I started to feel less faint, but I definitely had a panic attack on the table. I kept telling them that I couldn’t breathe and I just couldn’t get a good breath. My anesthesiologist was amazing and he kept reassuring me that my oxygen levels were great and he attempted to distract me. After awhile, I felt the pulling and pressure and at 12:44am I heard a tiny little whimper (I think he was still inside me at that point because I hadn’t felt them pull him out yet). After that, I felt them pull him out and two more whimpers. I don’t remember if they said, it’s a boy or anything. All I know is that five minutes later they took John and had him follow the baby to be weighed, washed off etc. I’m so happy that John was able to experience that, but feel a little robbed of the fact that I wasn’t able to see him until a bit later. Before they left with my baby (to head to the NICU_, they brought him up to my head so I could see him. He was beautiful. 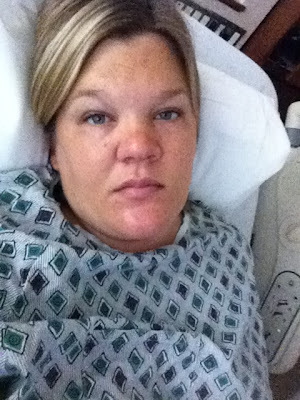 After my c-section, I had to go to recovery and at this point, John and I were SO exhausted. We thought we’d only be there for an hour, but I guess something was slightly wrong (I still had a fever, I was bleeding a lot and my heart rate was really high), and we were down there for 2-3 hours. Finally, on the way up to our room, we got to stop at the NICU to see the baby. John and I were both able to hold him for the first time, but I was devastated that we had to leave him there (it was 5am by this point). Although my story is a bit scary/overwhelming etc., in the end, everything that happened was worth it. I am so appreciative of my doctor and everything that she did. I had a lot of factors going against me-- small pelvis, large baby, a fever, my water broke and we were approaching 24 hours, I wasn't progressing, and my baby was in distress. I have my perfect baby and my c-section recovery has been a breeze. I was stuck in the hospital for 5 days because my fever never went down and my white blood cell count was crazy high. After the fact, I’m pretty sure that it had nothing to do with a uterine infection at all and it was probably related to an infected lymph node that I had developed (and ignored) two weeks before I gave birth. I’m kicking myself now for not taking care of that earlier because as a result, Grayson was in the NICU and I had to spend 5 extra days on IV fluids and antibiotics, but what can you do. Thankfully, Grayson only spent 36 hours in the NICU before he was released back up to our room. He was given antibiotics as a precaution, but luckily if I had an infection, it never spread to the baby (which is what leads me/my doctors to believe that it wasn’t a uterine infection after all). If you are having a c-section, don’t let my story scare you. I think I only panicked so terribly because I had already been in labor for almost 22 hours. I was exhausted, hot, tired and upset to hear that my baby was going to be whisked away to the NICU. After my c-section, I was up and able to walk out of bed by 9:30am the next morning and It really was not as terrible as I thought it was after I’ve had time to reflect. If similar complications arise, or if my doctor feels as though c-section would be more appropriate for any future children that we may have, I would not hesitate to do it again. Oh Ashley, AH-mazing story. I am so sorry you had to go through so much, but man is that little guy adorable. I hope you are doing well and enjoying your time! Congratulations on your new baby! I'm sure he was worth all of that! Congrats! I bet such a long and hard labor makes you appreciate him even more! Wow, you have quite a story! Glad it all turned out just fine! I'm super happy to hear you recovered well, and it wasn't as bad as you thought. I'm having a scheduled c-section on Wednesday - and I'm terrified! Congratulations on your beautiful baby - he's just gorgeous! Congratulations! Enjoy every moment of being a mommy. That's one heck of a story!! Great job and congrats again!! Wow! What a story. I hope little Grayson is doing well and that you are healing alright. Best wishes to you and John! Thank you for "keeping it real". Congrats to you and John on your beautiful little boy. I didn't have a c-section, but my son had a conehead. They had to use the forceps to pull him out because I couldn't push him all the way. I was too damn tired. I'm glad everything turned out ok for you and Grayson. Every story is different and childbirth is never easy.